Headquartered in Pickering, ON, Lenbrook Canada Solutions (Lenbrook) is a Value Added Distributor focused on providing Communications products to the Canadian Market. Lenbrook distributes Motorola Two-Way radios and Realwear Head-mounted tablets which support many key vertical markets including Retail, Industrial, Construction, Education, Hospitality and Manufacturing over the past 20+ years. Lenbrook communication and service specialists are dedicated to joining customers with the communications technology products that they need in order to connect – whether on the job, in the workplace, at home, or on the road. Master technicians no longer need to travel, conduct personal visits or rely on standard telediagnosis machinery with limited abilities to look under the hood. Offsite fleet managers or remote technicians can point, touch and even use the HMT-1s to virtually highlight specific areas of the vehicle. Volkswagen Commercial Vehicle’s remote technicians can see what the onsite technician sees. The HMT-1 system “blanks out the other noises” so you can hear the other technician clearly. The experience has created more trust and transparency. Retailers are always in search for ways of increasing staff productivity while improving the overall customer experience. Over the past few years Lenbrook has worked with big box retailers across Canada (Sports Check, Canadian Tire, Costco, etc.) What we have learned is that in today’s market, retail stores are under pressure; they must evolve there technologies and stay current. More specifically there staff must be well informed; positioning themselves as value in the eyes of the customer. Shoppers typically have questions about a product or a request for a different size. They expect retail associates to be empowered with accurate answers all while being quick to respond. Motorola and Vertex Walkie Talkies improve efficiency and productivity – from department stores to large warehouses and chains. When retailers equip their stores with the right communications technology, they create a real-time flow of information between associates and managers. Rather than leaving a customer’s side to search for inventory, staff can get the answers they need quickly and easily on the spot. If a spill occurs in an aisle, instead of broadcasting over an intercom or physically tracking down help, the right staff member can be alerted discreetly to resolve the problem. You need a reliable communication tool. 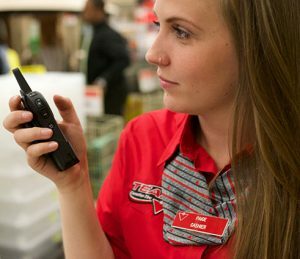 Our Walkie Talkies can provide instant, reliable communications to ensure your retail operations run smoothly. Our products are designed for the unique demands of the retail environment. We developed communication solutions that enable you to deliver a flawless experience for your customers. In retail, the shopper’s experience is everything. It’s how browsing becomes buying, retailer must influence the purchase path. With Motorola and Vertex communication solutions you can engage with your shoppers and keep them coming back. 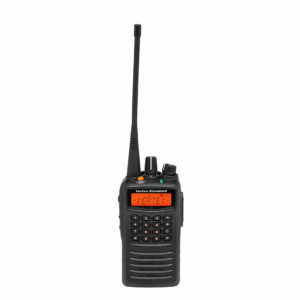 Our radios and accessories have been specifically designed to meet the needs of your staff. Lightweight and discreet they ensure crystal clear and real-time communications and let you deliver exceptional customer service. communicate and locate specific users. From line workers to maintenance and security, two-way radios make it easy for staff to work as a single, unified team while increasing productivity and worker safety. Two-way radios make it easier to deliver goods safely and efficiently while increasing customer service with accurate, real-time information. Give staff and faculty constant access to critical information and enhance safety and efficiency in your schools with portable two-way radios. Communicate discreetly with two-way radios to seamlessly coordinate your entire service staff and deliver enhanced customer service. Portable (handheld) – The most common two way radio also called walkie-talkie It comes with a rechargeable battery and charger. They normally come in 1 watts (CLS1413/CLP radios) 2 watt (RMU,) 3 watt (EVX-S24) 4 watt (all VX series radios (UHF and VHF), 4 watts (full power for UHF) or 5 watts for the VHF radios watts and normally can cover a high-rise building without any additional expensive equipment to boost the signal. Having “Group talk” ensures that needs, questions, and request are met immediately by a simple “Push to talk”. All radios hear. Two-way, push-to-talk radios have been in use for decades. They are synonymous with reliability, durability and security. Thanks to technology advances, today, two-way radios are making a huge leap forward – the move from analog to digital. Digital radios offer all the features of analog and more, yet there are still misperceptions out there about making the move. Let’s break them down and offer some reasons why making the switch makes business sense on many levels. Digital radios can also reduce your bandwidth imprint and costs. With digital, you can immediately double the capacity of your existing 12.5 kHz channel – greatly minimizing license costs and increasing the flexibility of your currently licensed spectrum. Going forward, you’ll realize more predictable capital and operating expenses thanks to the greater visibility into usage patterns that digital provides, so you can manage your infrastructure more efficiently. With the advent of smartphones, are two-way radios a fading technology? While smartphones combine the best features of many of the devices and applications that we use each day, they aren’t always the best tool on the job. The enduring popularity of analog two-way radios proves this. Yet, today, the same digital technology that powers smartphones has transformed two-way radios, combining the best aspects of smartphones with the reliability and power of push-to-talk radios – in one device. For example, digital systems allow more simultaneous talking paths while being robust enough to handle location information, text messaging, Wi-Fi, dispatch messaging and telemetry. Making the switch from a legacy system naturally raises anxiety about the impact on existing investments and processes. But moving from analog to digital is easy. If you decide to make the switch, there’s no need to rip and replace, you can make the move in stages and use your analog and digital radios simultaneously. It’s your choice whether and when you move one person, a business unit, or your entire team. From a low cost-of-entry to incredibly efficient cost of operation, digital two-way radios are a smart investment today, but they’re also just as smart down the road. In present day 2017 almost everyone and anyone is carrying a cell phone for their means of communication through personal relationships. You would expect to see this continued in the workplace. A recent survey by Motorola comparing cell phones vs two way radios found that manufacturing plants across North America; where only 33 % of plants use cell phones; while 31 % used two way radios. Plant owners see the value in the durability, battery life, practicality, security and reliability of two way radios. There are several different performance metrics when comparing cell phones vs two way radios. Cell phones are more than 3 times as likely to fail. Dropping the phone is generally the main cause of the phone not working. Lenbrooks two way radios are designed to withstand over a 4 foot drop. Manufacturing and industrial industries rely heavily on the fact that their working equipment is safe and durable. Two way radio conversations typically last 15 seconds whereas cell phone conversations last up to three minutes. Cell phones do add extra capabilities however cost considered with monthly service charges added to the initial purchase cost. You be the judge of value? An obvious feature benefit when selecting your cell phone or two way radio. Lenbrook two way radios can last over 15 hours on single charge. 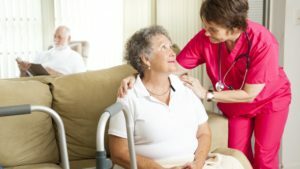 Two way radios allow for group communication which is common in such industries like health care, hospitality, and manufacturing. Cell phones are limited to one/one conversations. Which can be a problem if there is an emergency situation. Also two-way radios use private networks. So you can have that one to one conversation that a cell phone offers. Visit Lenbrook for more details. How to elevate your guest experience with a seamless communication solution? Guests want to be looked after and feel comfortable in a safe and welcoming environment. Exceptional service is one of the best ways to attract and retain loyal customers. Hotels, Inns, Motels and Boutiques must turn their guest into long term customers as soon as they enter their facility. But at the same time they must stay competitive on the market by reducing operational cost. Respond to your guests quickly, keep track of inventory/supplies, check room availability and manage staff. Lenbrooks two-way radios are leaders on the market and we look forward to working with your staff in customizing a seamless communications solution that works for you. Helping you run operations smoothly to deliver the great service that keeps guests coming back. Whether a mechanical issue with air conditioner or a problem at the pool, you need to connect instantly with maintenance and engineering staff. Orders get sent to the right departments and communication remains clear throughout the property. Lenbrooks two way radios provide clear coverage across the facility, which keep your operation running smoothly. When emergencies occur, you must have a security measure in place and it must be communicated quickly and quietly across the property. 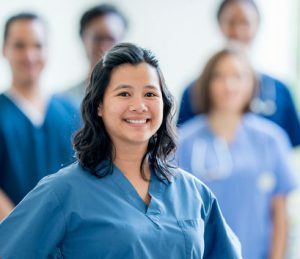 By giving employees and emergency personnel the right seamless communication solution they can guide guests to safety and provide real-time updates. Your housekeeping staff will operate more efficiently, rooms will now be ready for guests upon check-in. In turn wait times are eliminated and managers have visibility into all operations. With instant two-way communication, you create a team environment that improves efficiency, enhances service and encourages repeat visits. So you can run your operations smoothly and deliver great service that keeps customers coming back. 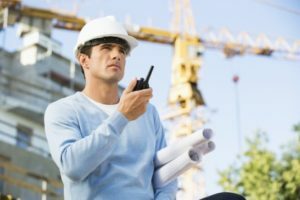 What is the cost of two way radios? Like almost every product on the market, the first question business owners are going to ask is usually regarding what is the cost of two way radios? The problem that lies with answering this question is that the number of options to choose from in terms of features. If you don’t know exactly what you would like; it can be hard to determine what your cost will be. Lenbrook Canada Solutions understands the wide variety of selection and we have narrowed and simplified the process. Our Motorola and Vertex Standard two way radios (Walkies talkies) are market leaders. 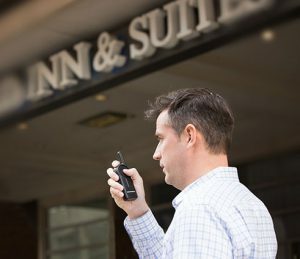 Lenbrook’s two way radios work great in businesses like hospitality, education, light construction, light manufacturing, property management, healthcare and retail settings. Offering basic communication and all features a user would require. Instant and clear communication allows for quick coordination and response to emergencies. 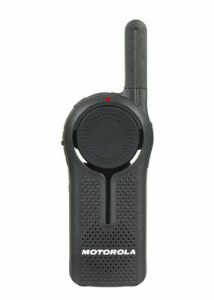 Motorola FRS radios can be sold at popular retail chains which include such as Canadian Tire, Costco, Home Depot, etc. These radios are for recreational/ family use. Talkabout Two-way Radios deliver dependable, instant communications hands-free or at the touch of a button. How to determine what radio is right for you? What are your conditions? Light, medium, or heavy industrial? 2. What is your use case? # of employees?